If you have a furry friend you may just like this brand new penny auction geared just towards pet owners. 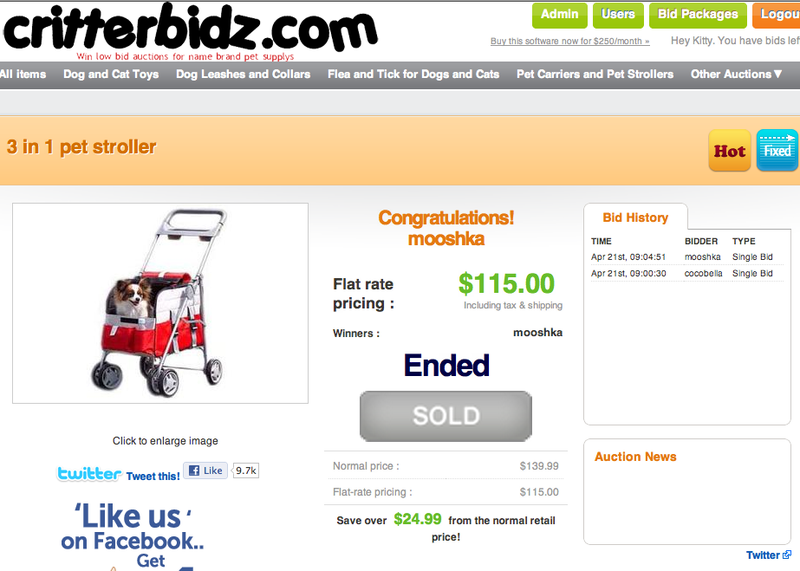 The site is CritterBidz.com and they offer a large selection of penny auctions for your pets. For dogs they have dog collars and leashes, dog toys, shampoos, flea and tick products, dog playpens, chew toys, bed and even pooper scoopers. If you’re a cat lover, you may like that they offer cat litter boxes, scratching posts, cat carriers, litter, cat toys, treats and catnip. Aquatic pet lovers may also enjoy that they offer aquariums, fish food, pumps, filters, aquarium lights and more. They’re not stopping at aquatic fish lovers, cats and dogs, they also offer penny auction items for hamsters. Bids on CritterBidz start at $1 and decrease in price to $0.94 a piece when the largest bid pack is purchased. 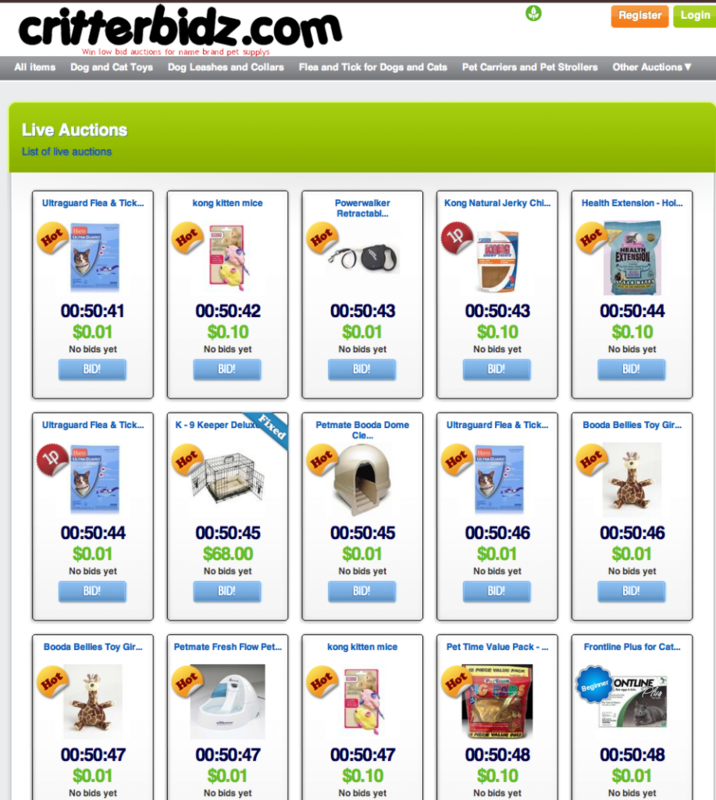 Take note: there are some reserve auctions on this penny auction site. It’s also important to note the shipping & handling prices, on many of the items this cost may be as much as the MSRP of the item. Just something to keep in mind if you decide to bid on this, and really, the same goes for other penny auction sites. For instance, their penny auction for a “Kong Kitten Mouse” has a retail price of $3.80, but the cost of shipping is $7.74; a K-9 Keeper Deluxe Dog Carrier has a listed MSRP of $71.99, there is a fixed price for the auction of $68.00, shipping is listed to be $30.28. So, while due to the shipping and some of the fixed price auctions, you may not get a great deal bidding on this penny auction site, but that’s for you to decide. Concern: When logging in as a user the admin control panel was open to all members to click on, when clicking on this you could see that there is a user associated with the critterbidz.com email address and has bid and won items. Were they testing, or bidding over real bidders? 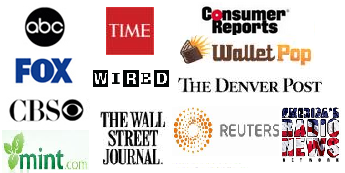 Are they doing this to shill bid so that others do not ever actually win? We sure hope not. I e-mailed them about this and told them we hoped they were not shill bidding, now they fixed it and their cp is not open. What do you think of this penny auction site? Would you bid on CritterBidz.com? Are they legit, or is something fishy? 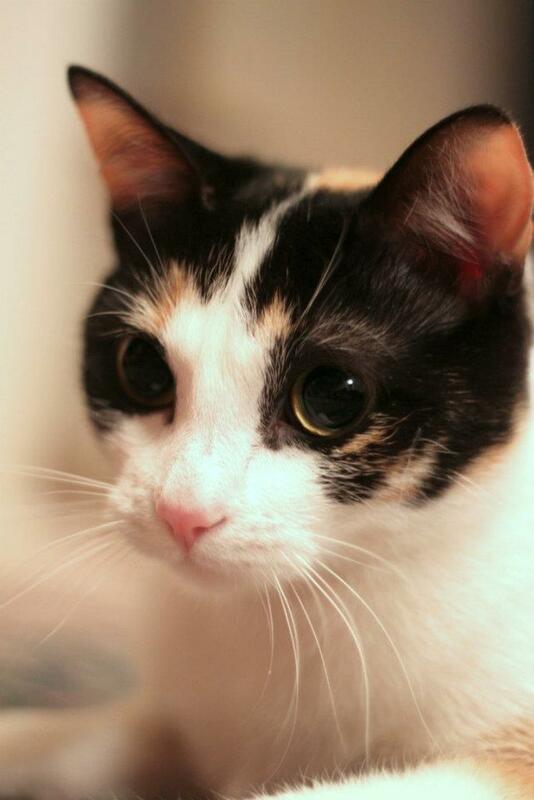 Come on over and discuss this in the PAW forum!- My cat, Dragon. Yes, that really is her name. This site closed after three days, they kept the bid money and you cant get the auctions won.